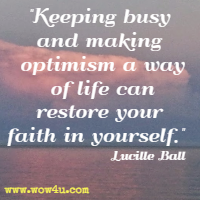 I grew up watching Lucille Ball; her comedy was one which always brought a smile to my face. 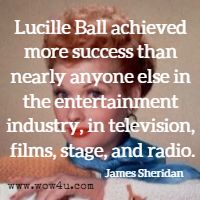 She achieved her her greatest success with her TV show, "I Love Lucy", which first aired in 1951 and ran until 1957. 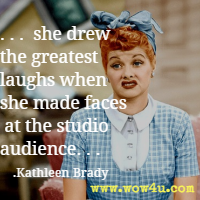 She also starred in "The Lucy Show" and "Here's Lucy". Her career of 50 years is one that brought a lot of people smiles to their face. 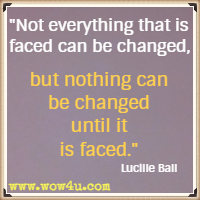 There is a museum dedicated to the life of Lucille Ball in Jamestown, NY, the city she was born. I am not funny. My writers were funny. My direction was funny. The situations were funny. But I am not funny. I am not funny. What I am is brave. I have an everyday religion that words for me. Love yourself first, and everything falls into line. It's a helluva start, being able to recognize what makes you happy. Luck? I don't know anything about luck. I've never banked on it, and I'm afraid of people who do. luck to me is something else: Hard work - and realizing what is opportunity and what isn't. I think knowing what you cannot do is more important than knowing what you can. A man who correctly guesses a woman's age may be smart, but he's not very bright. I would rather regret the things that I have done than the things that I have not. Whatever trouble she was in, Lucy could make it seem like the funniest thing anyone had ever seen. All over the country, people couldn't stop laughing. Pam Pollack; Meg Belviso, Who Was Lucille Ball?